Stenhousemuir grabbed their first win in the Betfred Cup after a comfortable 4-0 victory over Albion Rovers at Ochilview. After a goalless first half, Stenny scored twice in quick succession through Morgyn Neil and Conner Duthie to put them in control. On-loan Aberdeen youngster Seb Ross scored his first for the club with a lovely volleyed finish before Sean Dickson marked his return with a goal. Stenhousemuir moved to second with the victory getting their qualification hopes from Group E back on track. The Warriors were unchanged from the 2-0 defeat to Partick Thistle at the weekend and started brightly. They should have been a couple of goals to the good early on. Mark McGuigan, normally so reliable in front of goal, squandered two glorious opportunities, firstly shooting straight at Gareth Halford before flashing a header wide. Donaldson also had a chance but couldn't keep his header down at the back post. Rovers were playing their first game in the Cup and looked remarkably different from the side that lost to Ayr United on the final day of last season, with just Ryan Watters the sole survivor under new boss John Brogan. 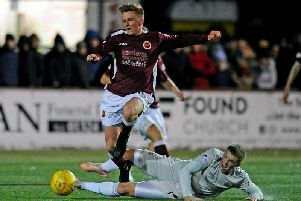 And the lack of continuity showed as Stenny dominated the proceedings but were suffering from a lack of sharpness in front of goal. Alan Cook was next to pass up a chance heading wide before he then blazed the ball over from the edge of the box. Stenny came closer to breaking the deadlock when Kieran Gibbons cannoned the post with an effort from the edge of the box after the break. However, their pressure subsequently paid off as Neil rose high to power a header into the back of the net on 55 minutes. Three minutes later It was two nil as Duthie showed good technique to fire beyond the helpless Halford. Brown Ferguson's men looked comfortable thoughout the game and were rarely troubled. It wasn't to be McGuigan's night as he was once again denied this time by a last ditch tackle by Scott Forrester. But the pick of the goals was undoubtedly from Ross who volleyed past Halford from Cook's inswinging delivery and Dickson rounded off the scoring from close range.